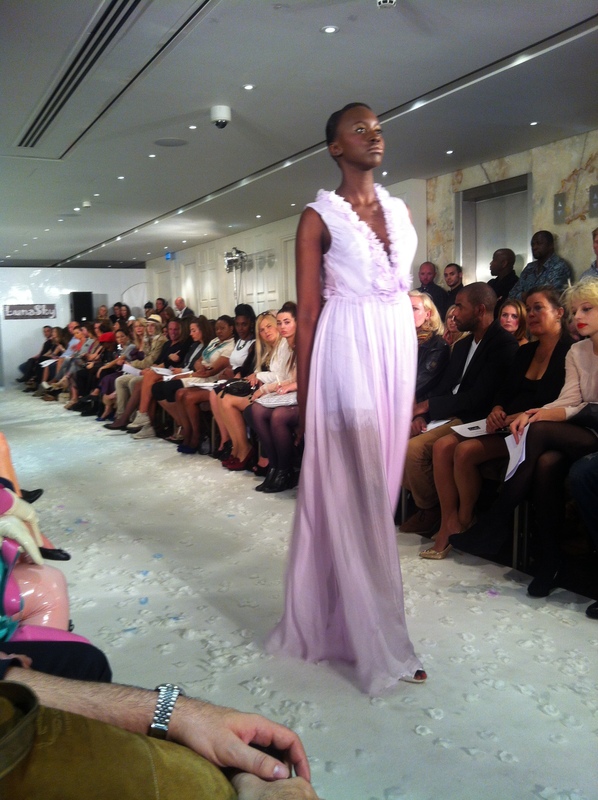 Last night I attend my first ever London Fashion Week event, Luna Sky. It was a fantastic opportunity to view the trends for next season and spy on some of the fashion elite. The designer was inspired by the 1950’s and Japanese Cherry Blossom (aka Sukura), and these elements really shone through on some of the gowns and cocktail dresses that were featured in the show. I have to admit that a few of the dresses did scream bridal party, but this may have been intentional. Everything from the music and the models to the hair and makeup had a subtle air of serenity. Romantic elegance and delicate femininity was the focus of the event. In terms of colours for next season, according to Luna Sky’s collection, we’ll be floating around in soft peach, faint pink, muted lilacs, and the most exquisite shade of turquoise blue. The show claimed to ‘accentuate the sophisticated elegance of modern women’. In my opinion it did this well and, whilst the collection doesn’t stand out in the same way as Burberry or even Philip Treacy, it is full of wearable piece that women can feel confident in next spring.